THE DRESSAGE RIDER'S DREAM HORSE!!! Little Herbie is a beautiful Friesian gelding, 16.1 hands, by Goeffert 369, born in 2000. He has excellent gaits, is extremely comfortable to ride, has a great canter and is gorgeous. He has tremendous natural athletic talent, loves flying changes, and has shown very successfully through fourth level and is ready to show PSG. He has an excellent half pass at trot and canter. He is safe enough to be a schoolmaster for the amateur but talented enough for the professional. He does not buck, rear or bolt. Little Herbie had a very successful 2010 show season. He received a 68.71% and 70.000% at Third Level Test 1. 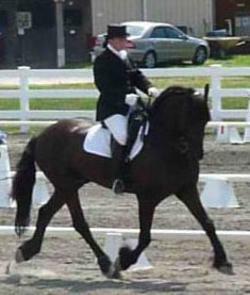 He showed Third Level Test 3 at the OCDA/ Windy Hollow Hunt Recognized Dressage Weekend Show 7/23-25/2010 and scored a 65.581% and 65.814% and won First Place out of 12 competitors (open). He also won his Third Level Test 3 Open class at Hits on the Hudson at Saugerties, NY out of 21 competitors. 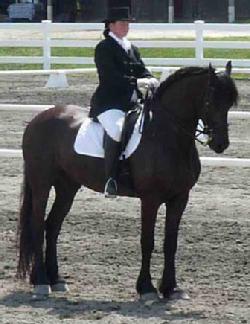 He qualified for USDF 2010 Championships at Third Level. Little Herbie showed Fourth Level Test 1 at the Garden State Classic. He won his open class with a 67.907% and won the Hobby Horse Hill Challenge Trophy. He also received a third place with a 65.116%. 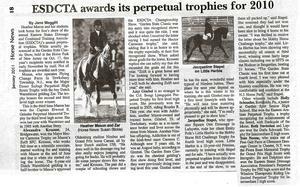 See the article written in Horse News below. He regularly receives 8s on his extended trot. Little Herbie is great for the vet, farrier, deworming, sheath cleaning and dentist, he loads and trailers very well, (one person can load and unload him by him/herself) goes in snaffle and double bridle, is light in the bridle, easy to keep round, and has no vices. He stands quietly on cross ties and is easy to groom, tack and handle. He stands still to be mounted (ground or mounting block). He is microchipped and has a Passport from Holland, but he is not registered. He was in professional training for most of his life at Belinda Nairn-Wertman's facility before we purchased him in 2007. Scroll down this page to view videos of Little Herbie. (The rider in the videos is 5' 7".) This is an amazing schoolmaster, to ride him is to love him! Contact us at info@equineparadise.com for more information about this outstanding horse. Scroll down to view YouTube videos of Little Herbie. Continue scrolling down past the videos to see photos. Click on the center of the YouTube videos to make them play. Winner of the Hobby Hill Challenge Trophy for Fourth Level High Score! If you wish to view these videos in HD: Click on title of the video. This is the wording written in the upper left corner of the YouTube video before it begins playing. These words are a link and will take you directly to YouTube where you are given the option to view these videos in HD. Contact info@equineparadise.com or call 973-702-1343 for more information about this lovely Friesian! Click here to return to the Horses For Sale page.